When I was in Oxnard, tailing along with Gabriel Geller to taste the new wines from Herzog Winery, late in 2017 (a couple of months after the harvest), we met with Joe Hurliman and Joe Herzog. As they were showing us around, I saw my old friend Josh Goodman standing next to a barrel. Josh used to live in San Jose, CA early in his career with Herzog, when the winery was situated in San Martin, CA. Herzog Cellars started in 1985 and it was located in the old San Martin Winery. Josh and Jordana were members of our shul for close to two years. It was heady years in those days, lots of young and hip folks. Wine and food was center of what was our shul at that time, and it was fun hanging with Josh in those days. Sadly, in 1998, Herzog moved the winery to CWS in Santa Maria, and they hired the now head winemaker, Joe Hurliman. I would see Josh every year at either the IFWF or the KFWE first in Los Angeles, in varied locations. Josh was hovering over that barrel and its contents, like a mother hen over its fledglings, and personally, I saw that love in the wine. It was a Rose from Pinot Noir, and Joe and Josh would continue to perfect that wine until it was worthy of the tasting room reserve label. I really enjoyed the wine, I must say and it showed quite well for me. The weight and the oak were clearly perceived, but they were in balance and control, and I found those characteristics to be more enjoyable than I would have expected in a rose. Clearly, this is not a quaffing rose, it is more an appetizer rose, and one that can be enjoyed with a slightly larger range of food options. Bravo to Josh and the Herzog winery. In my opinion, and in regards to my notes, this is ts best rose from Herzog for me this year. This wine is fun, it has done so much right with things that could go so wrong. Sadly, I have been asked to taste horrible oak driven roses, or acid-free disasters, or dark roses that make me wonder why the word rose is on the bottle. This wine has so many things that may make me wonder if I was being punished yet again, but thankfully this wine is truly fun, yes it has oak, but in lovely control, followed by a darker than normal color for a rose but hey not everyone loves Gris, finally the wine is well balanced with fruit, and it is not a tropical fruit bomb – bravo! The nose on this wine shows lovely smoky oak notes, with lemongrass, ripe strawberry, with hints of passion fruit, and lovely summer fruit. The mouth on this medium bodied wine is really fun, it shows a great acid core, followed by more oak, nice salinity, pink grapefruit, that gives way to flint, smoke, and green notes. The finish is long, sweet, with hints of oak, rich vanilla, and lovely tart fruit that lingers long, with flint. Lovely – Bravo! Drink Now. Well, after the first post I stated that I would be doing this rose wine post a few times. The subsequent posts would have the original content, and the newly revised or added rose wines as well. Well, this is part 3, and I hope this is the last one! My schedule was insane, but it is now slowing down, thankfully, so I hope to be adding more posts as well! It is still officially Summer, which means it is Rose time! Rose wine in the non-kosher market is exploding – especially Rose wine from Provence; a wine region of France. Sadly, in the kosher wine market – that is not quite the case. I did not stress my previous statement with a suffix of AT ALL, even though I am not allowed to open a bottle of rose on my Shabbos table with guests – why? Well, that is simple – no one will drink it!! Even worse, is that wine manufacturers may well have jumped the shark! There will be some 50 dry-ish kosher roses available in the USA this year! That may not sound like a lot, but when all you had was Herzog White Zinfandel 10 years ago – it is insane. The first high-end rose was Castel’s 2009 rose and that was only 9 years ago. Back then, there were few to no real Rose wine options, other than a handful of Israeli wines and almost no French Rose made it here. Now we will have tons of Rose, and I really think the real question here is will people drink it all? What is a rose wine? Well, simply said, a rose is a wine that can best be defined as the wine world’s chameleon. Where white wine is a pretty simple concept – take white grapes, squeeze them, and you get clear to green colored juice. Yes, the white grape juice is clear – well so is red grape juice, but more on that in a bit. Well, after the first post I stated that I would be doing this rose wine post a few times. The subsequent posts would have the original content, and the newly revised or added rose wines as well. Well, this is part 2, and there will be at least a part 3 or maybe a part 4, such is life. My schedule is insane right now (not complaining in any way), so when I can grab a few moments to update the roses I have had, I take it with both hands! It is still officially Spring, which means it is Rose time! Rose wine in the non-kosher market is exploding – especially Rose wine from Provence; a wine region of France. Sadly, in the kosher wine market – that is not quite the case. I did not stress my previous statement with a suffix of AT ALL, even though I am not allowed to open a bottle of rose on my Shabbos table with guests – why? Well, that is simple – no one will drink it!! It is officially Spring (though it snowed in Chicago for Passover – so I will hold judgment on that fact for a bit), which means it is Rose time! Rose wine in the non-kosher market is exploding – especially Rose wine from Provence; a wine region of France. Sadly, in the kosher wine market – that is not quite the case. I did not stress my previous statement with a suffix of AT ALL, even though I am not allowed to open a bottle of rose on my Shabbos table with guests – why? Well, that is simple – no one will drink it!! What is a rose wine? Well, simply said, a rose is a wine that can best be defined as the wine world’s chameleon. Where white wine is a pretty simple concept – take white grapes squeeze them and you get clear to green colored juice. Yes, the white grape juice is clear – well so is red grape juice, but more on that in a bit. To say there were few highlights at this year’s sommelier, would be an understatement. Though, many of the “stalwarts” were absent this year. The consensus was that while Sommelier is a great marketing tool, it does not reach the end consumer well enough, and as such it is really a better tool for startup wineries – to display their wares to professional wine buyers, than bigger and more established brands. The problem I have with that mentality from these wineries, is that they are missing point of Sommelier! Sommelier is not a wine venue it is a wine promotion vehicle, and there is the rub! More on this in a bit. A few larger brands were indeed here this year, but they used it for displaying new varietals, like Tabor pouring their Tannat and Marselan wines. Yarden was also at the show, but they were highlighting the 2008 Blanc de Blanc bubbly, which makes little sense to me, as it is a past vintage in Israel, they are now on 2009 in Israel, though the 2008 is available in the USA and Duty Free. Of course, it did not diminish my happiness in seeing the wine, I used it predominantly as a means to cleanse my palate after a tasting far too many of the smaller winery wines, which were undrinkable, and that is truly being nice/PC. Sadly, for me, Gvaot was a no-show, which is understandable at this point given their brand recognition and quality. Same goes for Netofa which also bowed out this year. Carmel and Yatir were also no shows, along with no Midbar, no Kishor, or Galil, or even Barkan (more on that in a minute). Really, it was new or fairly new wineries covering the walls like lilies on a summer day. Sadly, lilies would have been a better use of the space, but that is not my call of course. So, all this means is that another year has passed, and nothing has changed, which is exactly what I was worried about in my last post. My clear unhappiness, is not pointed at the Sommelier event itself, or at its promoters. On the contrary, the way I see it, it is a badly needed wine event. To me is is the event where we find the next Netofa, or Capsouto (who was there pouring his 2014 wines), but it is also the only event revolving around the wine industry as a whole left in Israel. 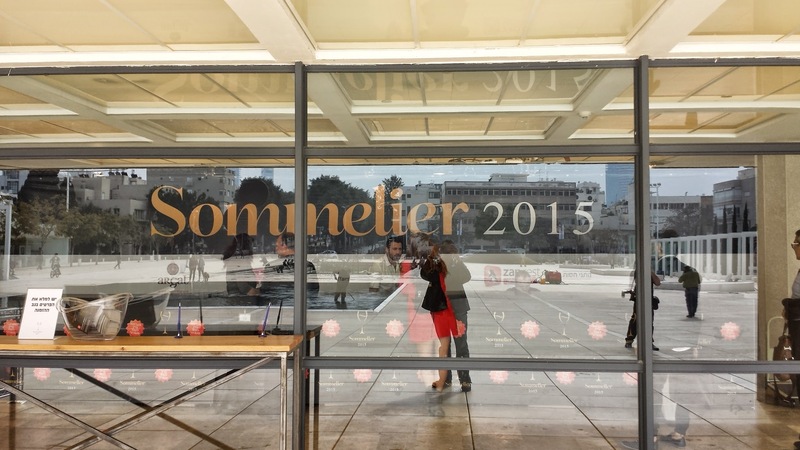 Sure, we see it as the event where we get to taste lots of wine is a single place, but there are other aspects that I am now understanding about Sommelier that are very important as well. Sommelier plays a vital part in the Israeli wine world, is is currently the only Israeli wine event that is focused on the wine industry. Sadly, ISRAWINEXPO died after the 2012 vintage, and even that one was a bit of a disappointment. Sure, there is the PYUP and Jerusalem, tel Aviv, and other festival wine events, but those are far more consumer wine related events than industry focused. Without the constant marketing of Israeli wines – at large to the global public, Israel becomes a one trick pony – kosher wine. I have asked countless wineries why there is no REAL Israeli wine association, one that is fully inclusive to all wineries that export to major outlets around the world? Their answer, the government does not deem them agriculture and they have no interest in helping. OK. But Napa Valley has received no Government help, neither has Paso Robles (LOVE these ads), or most any in the USA or South Africa. 4. Tabor Winery (they continue to excel at the Adama series, though the Adama II wines have lost a step since 2010). Still, the whites, rose, and reds of Adama were impressive. 7. Yarden – SOLELY for the whites and bubbles. The reds were all date juice, the classic example of a winery that has purposely and consciously taken the road of over ripe fruit. 10. Tura Winery (continues to push the boundaries and improving mightily. Love the Merlot, blends, and the new Gewurztraminer. Will post their wines on a separate post). Much of this post was already posted here, where I described my second week in Israel. Many if not all the pictures here (except for the bottle pictures) are all courtesy of Herzberg winery, as Gabriel Geller and I arrived so late that it was pitch dark by the time I meandered my way to the winery. 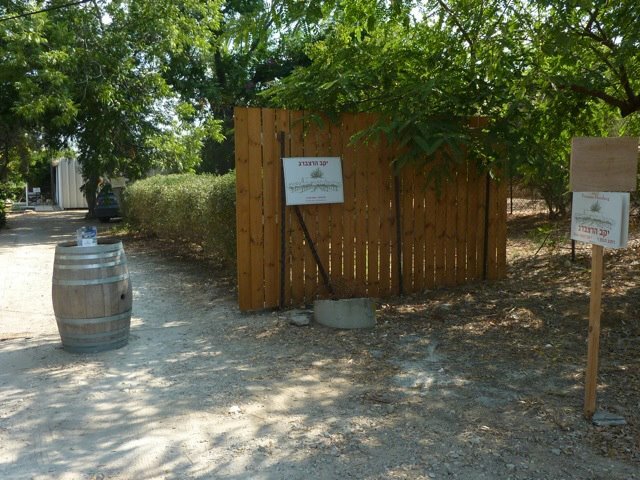 Herzberg Winery is a winery that is owned, run, and operated by a single man – Max Herzberg. It was pouring rain as we made our way to his lovely home – which doubles as his winery and vineyard. Yes, he reminds me of my good friend Benaymin Cantz (from four gates winery), another of those home bound Vigneron who live, breath, and eat winemaking in and around their very abode! I must say that many of my writings are more sentimental to me that rote and that is why it may seem that I do not write often, but I need the emotion and passion to be there before I can pick up my virtual pen and write these postings. It is not an excuse but more a reality and my apologies for having not written more about my Israel trip yet – more will be on the way soon, after passover. Max Herzberg is a world-famous biotechnologist who has single-handedly created and sold more companies than many of us even know or can keep track of. Max immigrated to Israel from France and quickly became a world-class biotechnologist and a leader in his field and in the corporate world! However, after getting his fill of running biotechnology departments at universities and running and starting companies, Max decided he would plant a vineyard. One day Max approached his clearly intelligent wife (who happens to be a Tunisian – so that helps a lot of course) and asked if she minded if he planted a few vines? His wife replied, you mean you want to plant the entire field – right? 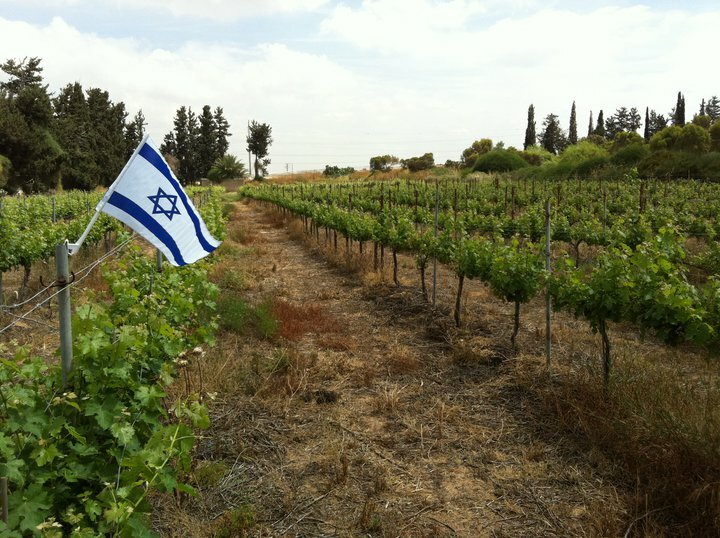 Sure enough, in 2005, by the time Max was done, the entire 3 acre field, right next to his home in Moshav Sitrya was planted with Cabernet Sauvignon, Merlot, and Malbec. It is not clear if this particular location within the Judean Hills is well situated for Malbec, but as Max puts it – time will tell. Max also makes use of Shiraz and Cabernet Sauvignon grapes from a neighboring vineyard. The first true year for the winery was in 2008, though there was some 300 bottles from the 2007 vintage. The 2012 vintage produced some 4500 bottles – nice realistic and manageable growth. Max does it all; he prunes his vineyard and sulfurs it with a machine, and of course makes the wine. The only thing he does not do is pick the grapes – by himself, he has folks to help with that!